For anyone who needs a break, we've created a special gift basket that is designed to refresh. 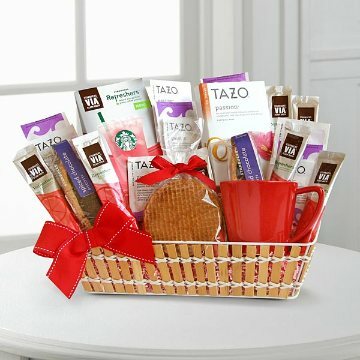 A lovely woven basket holds a red ceramic mug that is ready to be filled with Tazo "Passion" tea and Starbuck's Via Strawberry Lemonade Refresher, made from green tea extract. Your special recipient will also enjoy the sweet tastes of spiced chocolate biscotti and caramel wafer cookies. This gift includes the following: Ceramic mug, Tazo tea, Starbucks strawberry lemonade, chocolate biscotti and a caramel wafer cookie.